A few weeks after unveilling a first live excerpt with the song "The Party Is Ending", Swiss hip-hop/rock power-trio Fensta just debuted on YouTube its first official music video illustrating the single "School Dropout", extracted from its upcoming full-length effort 'APOCALIPSTICK' coming out early 2017 through Cold Smoke Records (Das Röckt, Hey Satan!, Hubris., Lilium Sova, Ogmasun...). Though the formation is recent, the members come from various respected scenes. Featuring Fred Vonlanthen (guitarist for Alain Morisod, involved in more than 2'000 shows during the last 20 years) on the bass and Nathan Gros (No Way To Escape, Hubris...) on the drums, the group's origin stemmed from a mutual will of getting out ofthe musicians’ habits. 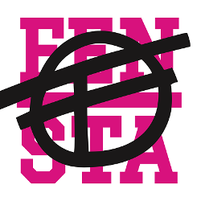 Influenced by bands such as RATM, Royal Blood and AC/DC, Fensta stands out by mixing powerful hip-hop drum rhythms, loud bass-guitar riffs and rap lines. Not only motivated by sharing the happiness of their music, the band approaches delicate topics with their strong lyrics and tries to promote a different way of thinking to its audience.